Did you know that we hold Trad Sessions here at The Thomas Moore Tavern in the heart of Wexford town every Tuesday evening? Our cosy tavern offers a unique experience to enjoy Trad music by a cosy fire with a wide range of dishes available throughout the day from our bar food menu available from 3-9pm or if you fancy a full sit down meal why not try our A La Carte Menu served in the Bistro from 5.30pm -9pm. 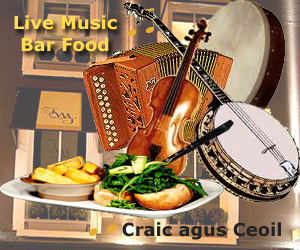 Locals and visitors alike get together for an evening of craic agus ceoil! What are you waiting for…See you later!